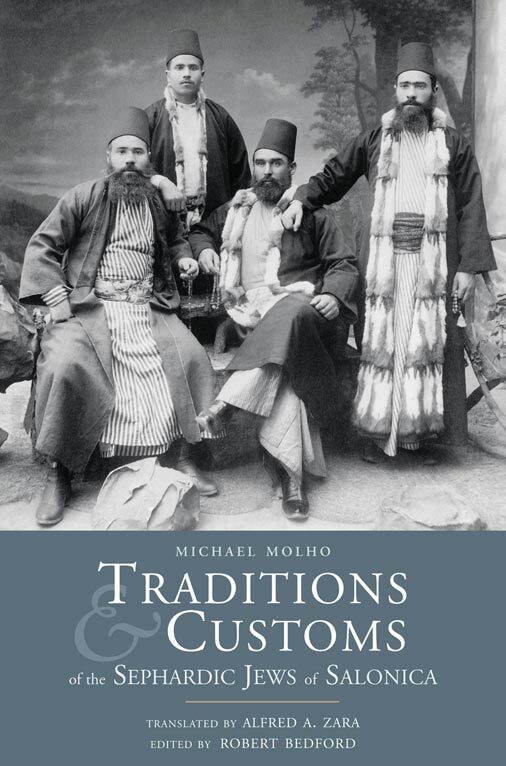 The Foundation for the Advancement of Sephardic Studies and Culture (FASSAC) proudly announces the publication of an annotated edition on the Sephardic Jewish community of Salonica – Traditions and Customs of the Sephardic Jews of Salonica, by Michael Molho, translated by Alfred A. Zara and edited by Robert Bedford. 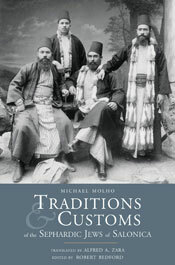 Appearing for the first time in the English language, Traditions and Customs is one of the most picturesque and colorful accounts of the heritage and culture of the Sephardic Jews of Salonica, written in 1940 by the late Rabbi Michael Molho, renowned writer and historian on the Jewish community of Salonica. At the heart of this volume are centuries of colorful songs, proverbs, customs, games, religious practices, festivals, superstitions, and scenes of family life. A great number of these characteristic customs were brought to Salonika by the Sephardic Jews fleeing the Spanish Inquisition in the late fifteenth century: The fear of God, which dominated the Sephardic world and penetrated deep into their daily life; the ignorance which kept alive the superstition of the masses; the purity of their customs and the sanctity of the conjugal home; the patriarchal way of life carried on by the Jewish family in their modest dwellings; the demonstrations of joy expressed by the people during wedding celebrations, circumcisions and Jewish festivals, as well as the sadness occasioned by their tragedies; the old-fashioned methods of educating the young generation, and the games to which children eagerly applied themselves. Initially written in French and published in Spanish, the manuscript was penned by Molho before the tragic destruction of the Salonica community, drawing upon a wealth of Hebrew and Judeo-Spanish literature, and incorporating memories and recollections from his personal experience and from the elderly generation in Salonica. The work is written with great passion and a deep appreciation and understanding of the Sephardic heritage, and the descriptions of the daily life of the Salonica Jews preserve a rich folklore and culture which tragically no longer exists. The book is highly recommended for anyone interested in Sephardic and Jewish studies and in the linguistic, religious and cultural history of the Sephardic Jews of Salonica and the Balkans. For nearly five centuries, Salonica (Thessaloniki in present day Greece) had a sizeable Jewish community descended from the Spanish Jews who had been expelled from Spain in the late fifteenth century. Up until the early twentieth century, these Spanish Jews, or Sephardim, dominated the city’s commerce and culture, making the port city the cultural, industrial and financial center of the Balkans. The colorful traditions, character and language of the Salonica Jews – which had changed little over the centuries – even after the transfer of the city to the Greeks in 1912, created a unique resistance to assimilation. Sheltered in their neighborhoods and grouped around their ancient synagogues, the Jews of Salonica were easy prey during the ruthless Nazi occupation of Greece from 1941-1944. In 1943, the entire Jewish community was systematically rounded up and sent to their deaths in eastern Europe. The destruction of the community was so complete that less than 4% of the population survived to return to Salonica at the end of World War II. Today, the Jewish population of Thessaloniki numbers under 1,000 – a mere fraction of the Sephardic presence which had once dominated the city so completely. 432+pp Hardcover with dustjacket. Maps, photos & illustrations.